Biologist Giacomo Bernardi videotaped tool use by a fish in 2009. 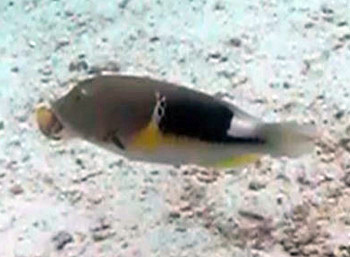 In this frame from the video, an orange-dotted tuskfish carries a clam in its mouth. See video below. 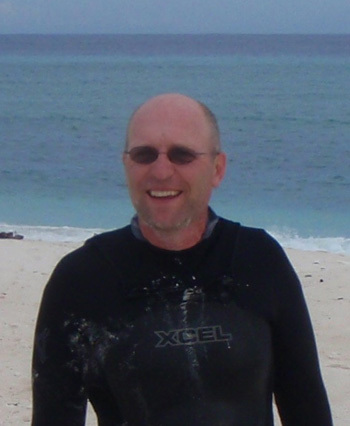 The first video of tool use by a fish has been published in the journal Coral Reefs by Giacomo Bernardi, professor of ecology and evolutionary biology at the University of California, Santa Cruz. In the video, an orange-dotted tuskfish digs a clam out of the sand, carries it over to a rock, and repeatedly throws the clam against the rock to crush it. Bernardi shot the video in Palau in 2009. "What the movie shows is very interesting. The animal excavates sand to get the shell out, then swims for a long time to find an appropriate area where it can crack the shell," Bernardi said. "It requires a lot of forward thinking, because there are a number of steps involved. For a fish, it's a pretty big deal." The actions recorded in the video are remarkably similar to previous reports of tool use by fish. Every case has involved a species of wrasse using a rock as an anvil to crush shellfish. A report published in June in Coral Reefs included photos of this behavior in a blackspot tuskfish on Australia's Great Barrier Reef. Bernardi said he first heard of the phenomenon in 1994, when a colleague (James Coyer) observed a yellowhead wrasse in Florida doing the same thing. Similar behavior was also reported in a sixbar wrasse in an aquarium setting. "Wrasses are very inquisitive animals," Bernardi said. "They are all carnivorous, and they are very sensitive to smell and vision." Wrasses are one of the largest and most diverse families of marine fishes. Bernardi noted that several of the species observed using tools are not closely related, but cover a broad range of evolutionary history within the wrasse family. "They are at opposite ends of the phylogenetic tree, so this may be a deep-seated behavioral trait in all wrasses," he said. Tool use was once considered an exclusively human trait, and Jane Goodall's reports of tool use in chimpanzees in the 1960s came as a stunning revelation. Since then, many other animals have been observed using tools, including various primates, several kinds of birds, dolphins, elephants, and other animals. Bernardi, who studies fish genetics, said there may be other examples of tool use in fish that have not yet been observed. "We don't spend that much time underwater observing fishes," he said. "It may be that all wrasses do this. It happens really quickly, so it would be easy to miss."